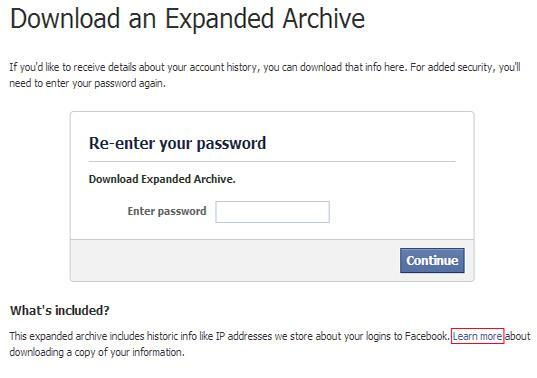 What is Facebook’s Enhanced Archive feature? The enhanced archive feature allows you to download an entire record of all your activity on Facebook to date. See every post you ever wrote, all images you uploaded. The archive, originally introduced in 2010, includes a copy of what you’ve shared on Facebook, such as photos, posts, messages, a list of friends and chat conversations. Now with the enhanced archive option, you can access additional categories of information, including previous names, friend requests you’ve made and IP addresses you logged in from. How do you archive your Facebook? B) Choose your enhanced archive by clicking the expanded archive link. Bear in mind the warning that we’ve highlighted in the blue box below, that your archive contains private material. Enter your password and begin your download. Facebook have produced a guide to what type of data you can expect to find in your archive, access this guide by clicking the Learn More link. Your archive contains your entire history with Facebook. It can take a large amount of time to compile, taking up a lot of bandwith and may contain content that you may wish to remain private, so might be best not do that in the office! However, all is not as it seems with the archive feature as was highlighted in June 2013 when a bug was found that inadvertently shared contact details when archives were created. Facebook were said to be “upset and embarrassed” by the bug which has since been rectified. 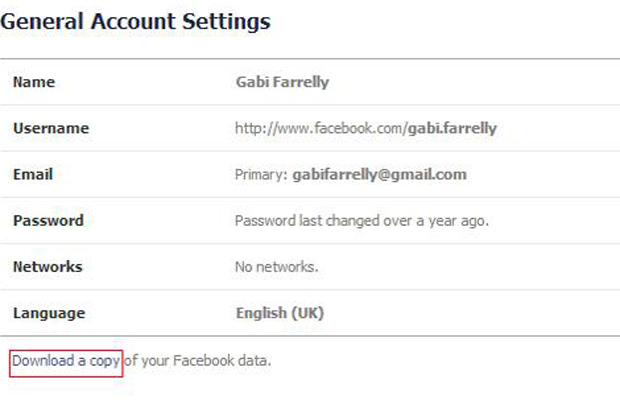 If you plan to permanently delete your Facebook account you might like to download your enhanced profile to have a record of what you did and perhaps the images you uploaded. However, please note, your data may still remain on the Facebook servers.